Skye Gravestones | Ewen & Flora (Mackay) Macintosh, Neil & John. Ewen & Flora (Mackay) Macintosh, Neil & John. 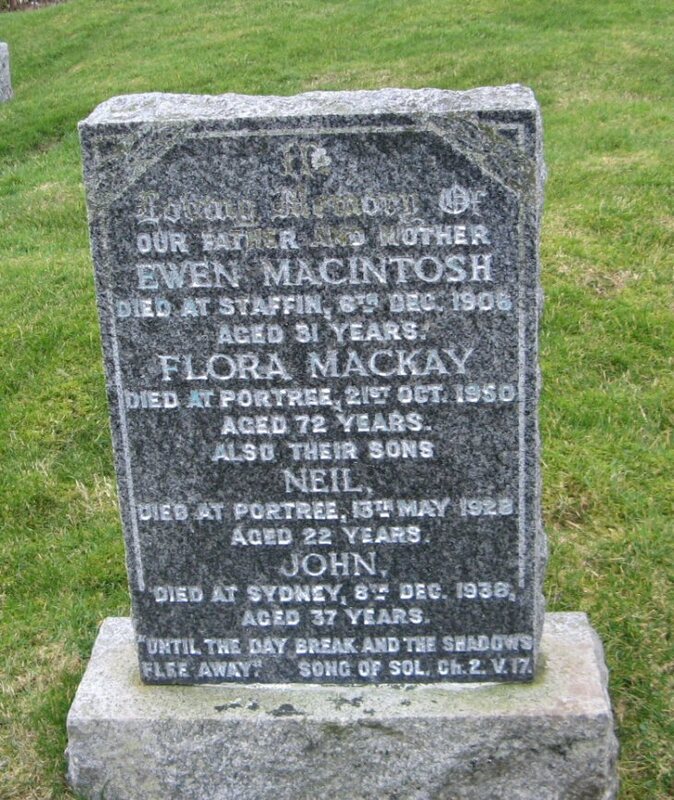 In/loving memory of/our father & mother/EWEN MACINTOSH/died at Staffin, 6th Dec. 1906/aged 31 years/FLORA MACKAY/died at Portree, 21st Oct. 1950/aged 72 years/also their sons/NEIL/died at Portree, 13th May 1928/aged 22 years/JOHN/died at Sydney 8th Dec. 1938/aged 37 years. "Until the day break and the shadows/flee away." Song of Sol. Ch. 2 V. 17.